Had to sell my 40ft steel nb last year due to a family crisis. Had been a liveaboard for 14 years. Looks like I will have to buy another boat or rent a flat lol. Anyway I am beginning to come around to the idea of a GRP cruiser as a liveaboard. I will have a max of 25k available. However most steel boats at this price are old , with hulls that have seen better days. I spent 6/7k on my last boat to keep the surveyor happy. I know there are exceptions around , but not many. So....I thought , save the hassle of worrying about rust and pitting and buy a GRP. Ok they have disadvantages when considering internal space and perhaps condensation. But I'm sure I could fit a stove and whatever else is needed for comfort. Am I kidding myself lol. There's some excellent GRP boats out there for less than 10K. With 25K, I reckon you can get far more boat for your money if you look beyond samey steel narrowboats. 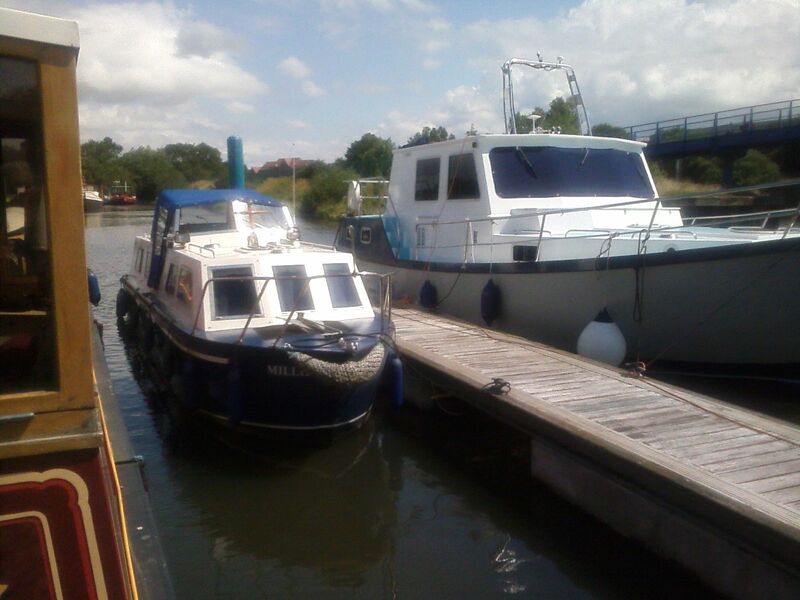 We lived aboard a GRP Broads cruiser and we were always warm, no condensation issues and I fitted a Glembring drip feed diesel heater which meant having a chimney which was not a problem to fit. As it was built circa 1980 it was built like a tank. Back in those days GRP was relatively new material for boats and you can imagine the conversation, " well how thick shall we make it? I dunno, 1/2 inch? Nah make it 3/4, OK"
Where do you plan to keep the boat? This be a big consideration with what boat you choose. If on one of the rivers then you will get a lot of GRP boat for your £25k and certainly something that you can comfortably live onboard. Looking at Broome 30 ,also known as Ocean 30 etc. Few about asking around 22.5k. Widths 9 and 10 feet. Looks promising, have to check one over. If your budget is £25k you can look at boats a bit over that as they are always open to offers. I would be looking at boats advertised at up to around £35k if you are in a position to offer a quick cash sale. 25K will be more than enough for a fibreglass cruiser. You need to ask yourself several questions. Wide beam or narrowbeam. Staying in one place or cruising.Petrol or diesel.Outboard,outdrive or shaft. Livingaboard requires heating,(a stove) in which case forget about petrol. Outdrives have not got a very good reputation for reliability,and I can only think of two narrowbeams with shaft drive (Freeman and Creighton) I am sure there are others. As Mr Ambrose pointed out,an older GRP cruiser is likely to be more substantially built than a modern one. My choice would be an older widebeam,70s or 80s,shaft driven, diesel engine. so you could more safely fit a solid fuel stove. You can very safely fit diesel heating to petrol powered boats. Diesel heating would be my option for any GRP boat rather then a stove. There is far less mess involved. Our outdrive has been really very reliable but and it is a big but we do service it every year which does need to be factored in because even doing the work ourselves it is not cheap. It does however offer the benefits of offering better fuel economy then a traditional shaft drive and also better access to very shallow water. Older boats may well have used much thicker lay ups than newer GRP boats but that is only because the material was not so well understood. The sheer number of old Broads boats still in hire gives testiment to their build. Hire boats however have always been laid up much more heavily then private boats as they are expected to be subject to far more bangs, knocks and scrapes over their lifetime. The 'little' one is 32 foot, we are 35 foot. There is a HUGE internal space - our aft cabin has a queen size bed, wardrobes and dressing tables either side of the bed, an en-suite shower room and an en-suite toilet & basin. It is not a Canal-Boat but the Rivers and the Seas are our 'Lobster'. I am assuming you mean diesel (or gas) hot air heating as these systems are room sealed. Personally,I would be unhappy about fitting a non room sealed heating system (including non room sealed gas water heaters) on a petrol powered boat. I know people do fit unsafe (in my opinion) heating systems in their boats,but the thought of petrol vapour igniting in a fibreglass boat,fills me with horror. but the thought of petrol vapour igniting in a fibreglass boat,fills me with horror. It would be far worse in a steel boat - at least with GRP the force will shatter the boat, with a steel hull all of the force will be retained inside and do a lot more damage to human tissue - bit like a 'round' going off inside a tank - the inhabitants are splatted . The BSS decided to ban the use of gas-fridges on petrol boats but back-peddled and they can still be used with a flame trap. or piped to the appliance as required? linear cm (28 wires/per inch) mesh. the Rivers and the Seas are our 'Lobster'. ...soup kitchen floor wax museum? Found quite a few decent broads boats. However , many are at marinas on the east coast. Bit of a problem getting onto the K&A lol. Bit of a problem getting onto the K&A lol. I just assumed it would necessitate overland at some point. I quickly tried Google but could not find any definitive answer. Hmm have to look into it. Never considered the east coast. I was thinking more , canals and rivers lol. A bit of nice weather - slip out at Lowestoft and you are up the Thames in no-time. Or stick it on a truck and get it there if the coast doesn't tickle your fancy. Transporting boats needn't be that expensive if you can work around back loads. That is why you fit equipment safely and in the correct fashion. Let's not forget that there are plenty of fires on diesel powered boats as well. Lovely lowestoft. We did the trip from Lowestoft via Walton backwaters, Southend and up to London. Think it was 6 hours sailing to Walton.